“Corpos de Prova” (Bodies of Proof), Lucas Simões’s first exhibition at Patron, conjured a stark, almost antiseptic atmosphere, its compressive sculptures evenly spaced throughout the gallery. In pieces such as White Lies 14 (all works 2017),stacks of nonarchival computer paperdestined to curl and yellow over timewere pressed beneath or between rectangular or polygonal concrete slabs. Most of the unforgiving assemblages were in turn suspended on the wall or held aloft by empty metal rectangular prisms. 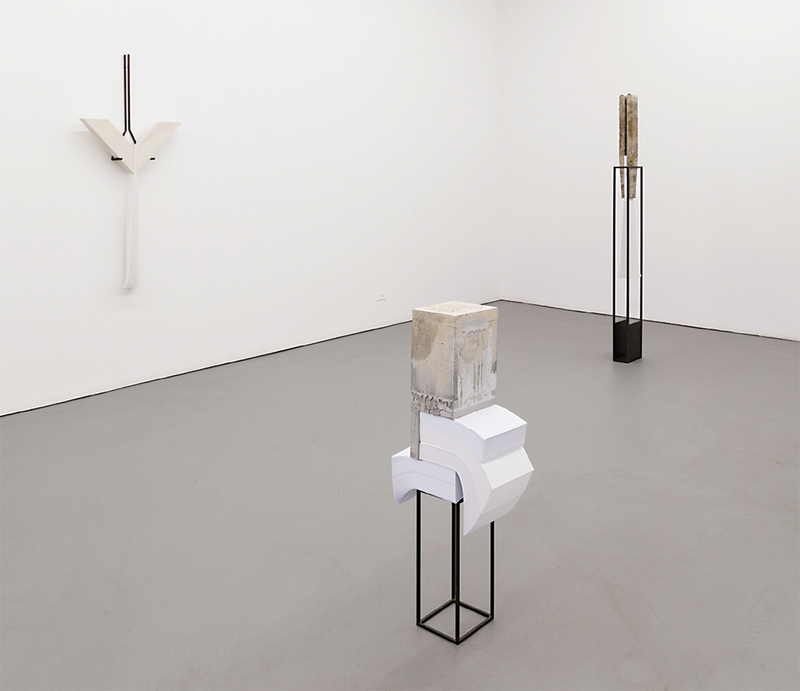 These objects could be regarded as bravura meditations on interdependence, grounded in a systematic set of revelations about paper’s weight-bearing capacities. In that sense, Simões’s works could also be considered structures with affinities to architecture, albeit at a reduced scale, rather than models per se.